Replacing a DVD drive in a laptop is very simple. Even if you don't have a lot of technical expertise this is something that you can do. There are no screws involved or opening up of the computer case. This is because most laptops all use modular drives that pop right out. A DVD burner is the drive that allows you to write data or video/audio files on a DVD disk. The amount of information that can be written to a DVD is typically 4.7 GB. However, double-layer DVD burners can write up to 8.5 GB of data on a disk. Devices with a LightScribe-enabled optical drive allow you to burn DVD labels as well. An installation of a new DVD burner on your laptop may be required due to the failure of the original hardware or as an upgrade from a CD/DVD-ROM (read only) drive. Get a replacement from the manufacturer. Laptops don't have big open cases that will fit any DVD drive you buy. The cases for the drive are somewhat proprietary to the manufacturer of the laptop. Call your manufacturer and give them your exact model and serial number to order the right sized DVD drive. Shutdown the laptop and make sure it is completely powered off. Disconnect the plug from the battery and set the laptop on a flat dry surface. Turn the laptop over. You may have to check your manual but most laptops have a button to push or slide to release the drive. Push the drive straight out and remove it from the laptop. Insert the new drive in the reverse way you pulled out the old drive. Insert an edge of a paper clip into the emergency eject hole of the DVD drive to open it. Gently pull out the disk tray. 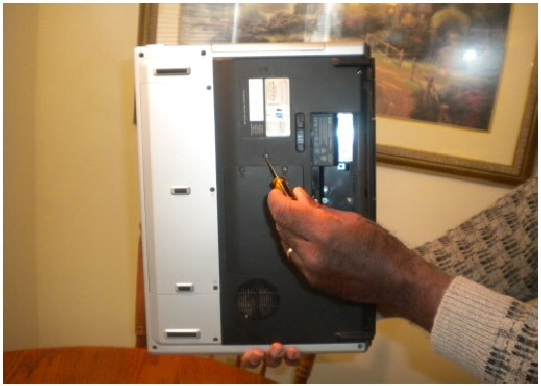 Locate two screws (one on some laptop models) on the back laptop panel that secure the DVD drive. You may need to consult your laptop manual for the information specific to your laptop. Unscrew the screws and carefully pull the DVD drive out of the laptop. Insert the DVD burner on the place of the old drive and slide it all the way down. Complete the hardware installation by securing the DVD burner with the screws you removed earlier. Turn the laptop right side up and turn the power on. The DVD drive will basically be automatically found and work either fully or with basic functionality. Install any drivers by inserting the CD that came with the drive or by downloading them from the website. Installing the driver may add advanced functionality that the older drive did not have. It’s that easy to remove the old Dvd Drive and replace it with a newer one. Whenever possible, get your hands on a laptop and try this yourself. It’s both easy and rather fun as well. Power is knowledge and using your knowledge the right way can bring you many financial blessings. Don't tamper with a laptop that's under warranty. Grab an older model and then Practice...Practice...and Practice some more.